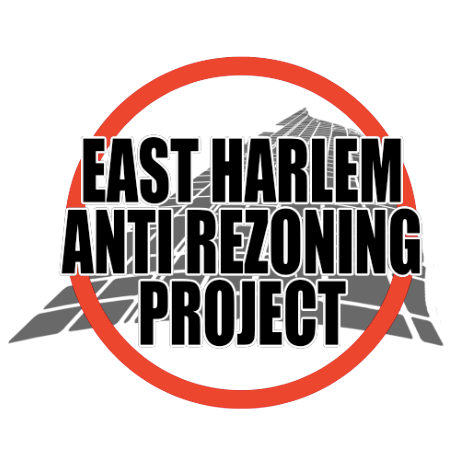 East Harlem and our beloved neighborhoods are being targeted by class warfare. Gentrification is class warfare. I’ll give you an example, our mayor in New York City, Bill de Blasio, has launched rezoning throughout the city that is supposed to open up 200,000 units of affordable housing. These units will be calculated using the Area Median Income for New York City, which includes counties outside of the city. Using the AMI makes these units unaffordable for the working-class tenants who have inhabited East Harlem and built communities there. African American, Puerto Rican, African and Mexican people will be displaced from their homes in favor of more affluent and mostly white tenants who can afford the rent imposed by the developers destroying our neighborhoods. We have learned from the Black Panthers, Young Lords and countless revolutionaries that militant organizing for people Power is the only way that we can truly challenge the oppressive power that seeks to dominate us. The only way that we can win against gentrification is to build a revolutionary and fighting mass movement that fights for the people and builds power for the people. From East Harlem to Boyle Heights we want nothing less.